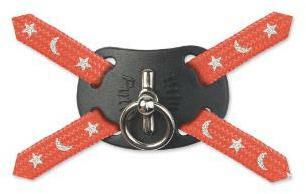 Ancol Cat Harness and Lead Set Moon and Stars Red. The new premium quality cat harness range is specially designed to be easier to fit and more comfortable to wear. With its figure of 8 design, the harness is simply unbuckled and the fixed loop is slipped over the cats head. next simply buckle the two remaining ends together under the chest, just behind the fromt legs and thats it.